Presented here, a very RARE Pennsylvania Dutch Double Kettle Lamp, with a trunioned movement on two separate axis. Made of mixed metals . . . the fonts are dovetailed copper, the stem as well as the supports are iron and the octagonal base is brass. 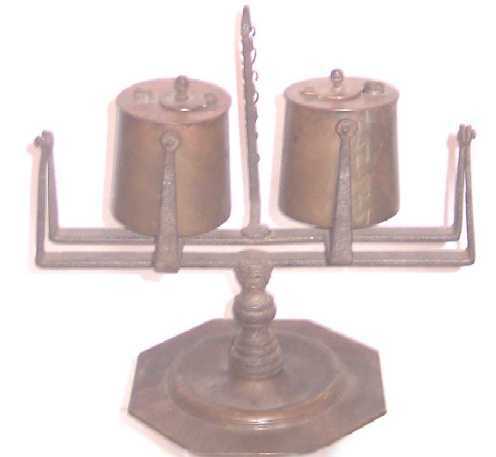 The rattail handle has what remains of the chain from which the wick pick would have hung but has since "gone missing". Even the filler caps are intact. Just add wicks and you're good to go! The lamp has a great patina and is in outstanding original condition. No apologies here! While we might occasionally see a single Kettle Lamp, we have never seen a double, not even in the lighting books. This is a very special piece of early lighting for the advanced collector and it is our pleasure to present it to you. Size is 8" long x 6" tall.